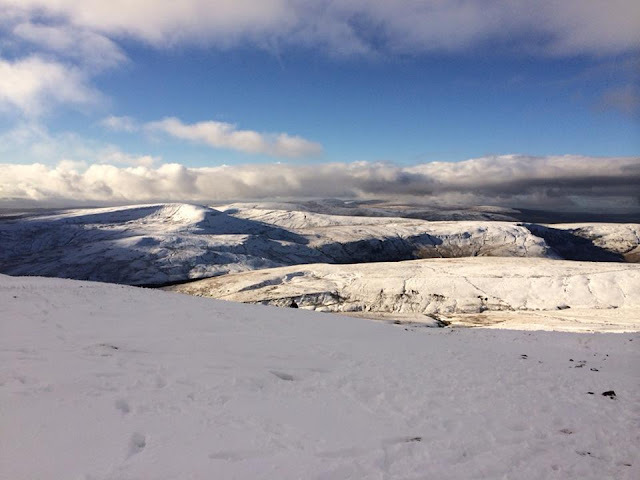 Rising to a height of 886 meters, the mountains of the Brecon Beacons (Welsh: Bannau Brycheiniog) are lower than the peaks of Snowdonia in the north of Wales, or the mountains of the European mainland. However, it is the remoteness of the bare, open hillsides which make this national park a stunning place to visit. The Brecon Beacons are characterised by vast grassy moorlands grazed by welsh wild upland ponies and is popular with hill walkers. The southern portion of the park has been termed ‘Waterfall Country’ due to the numerous waterfalls found in the area. Whilst visiting South Wales, a trip to the coastline of the Gower Peninsula is also worthwhile (see separate blog post from July 2014). Most of the hillwalkers who visit the park choose the hills in the centre of the park as they are the highest in the area, and paths are very well marked and maintained. For this reason, the paths can get busy, especially during the summer. Pen-y-Fan is the highest peak (886m) and offers stunning extensive views over the surrounding hills and moorlands and down to the town of Brecon and the farmland of Mid Wales. The easiest way to climb Pen-y-Fan is from either the Pont-ar-Daf car park or the Storey Arms car park (both on the A470 road). 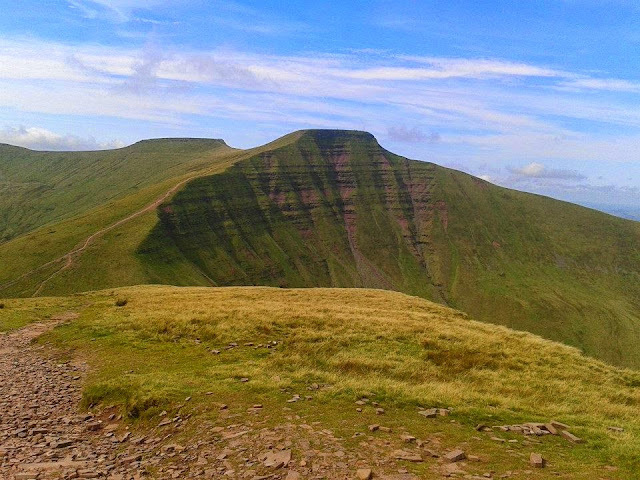 For people who enjoy hillwalking, I would recommend walking the Beacons horseshoe, which takes in the summits of Corn Du, Pen-y-Fan and Cribyn and gives outstanding views of the area. The summits are characterised by flat tops, and are bounded by very steep (almost vertical) north faces which make for very dramatic scenery, but also mean care must be taken! The best map to use in an Ordnance Survey (OS) map covering the central Brecon Beacons. 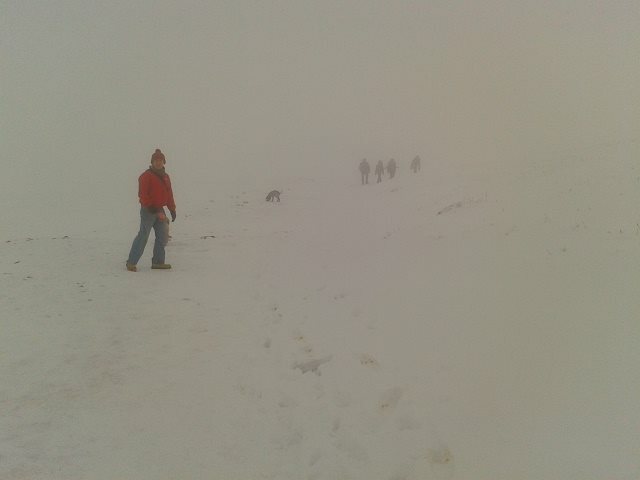 It must be noted that weather conditions in the Welsh mountains can often be hostile and change very fast, and summits are often covered by snow and ice during the winter. We made it! 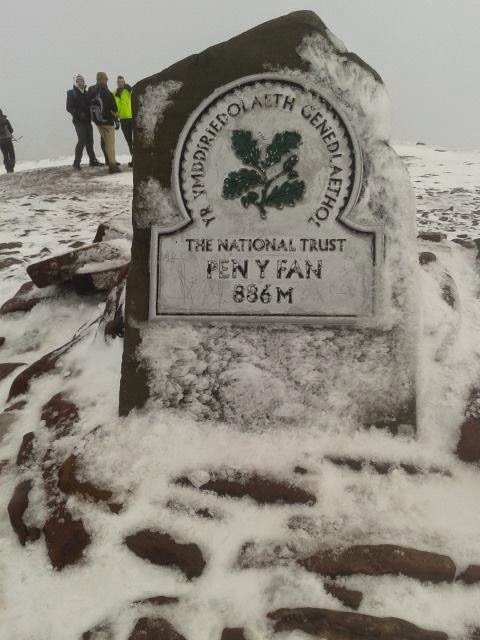 Pen y Fan summit marker on a freezing cold day! In the far west of the park, the highest peak of the Black Mountain, known as Fan Brycheiniog rises to 802 meters. This peak offers impressive views, but paths are very quiet as the area is very remote and paths are less well marked. 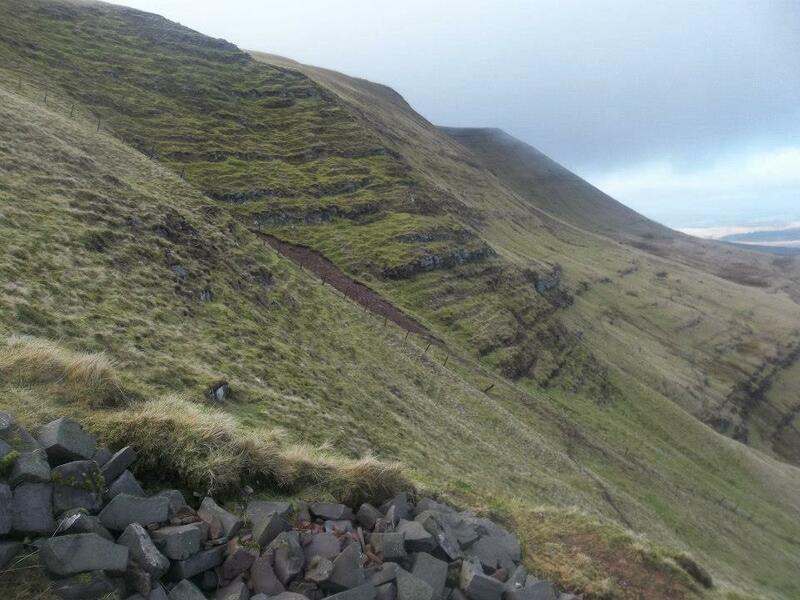 Because of this, Fan Brycheiniog is a harder walk than Pen-y-Fan. I would recommend an OS map covering the Western Brecon Beacons. The area just to the south of the village of Ystradfellte is famous for caves and waterfalls. I would recommend a visit to Sgwd Clun-Gwyn waterfall on the Mellte River, and the Sgwd yr Eira waterfall on the Hepste River. Both waterfalls are within half an hour walk of one another. There are some large, but very dangerous cave systems which can also be found in this part of the park, however safer way of seeing the caves is to visit the Dan-yr-Ogof showcaves just off the A4067 road in the Tawe valley. 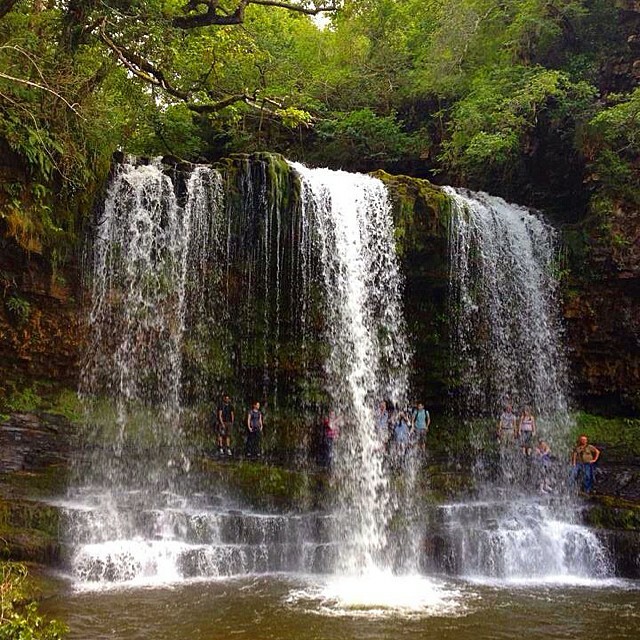 A good source of in-depth information is to visit the national park visitor's centre in Libanus, or the Waterfalls Visitor’s Centre in Pontneddfechan. For weather information, a good place to go is the Met Office website, which offers location forecasts as well as detailed national park forecasts. Brecon, Abergavenny, Llandovery and Llandeilo are all pleasant, albeit small towns to visit. A lovely place to visit for food is the Honey Cafe in Bronllys, which serves traditional British pub food and overlooks the Black Mountains. Wales is a bilingual nation with both English and Welsh being spoken – the majority of the local place names originate from the Welsh language. Welsh is quite different to English, and the local placenames are often tricky to pronounce for English speakers!! Winter weather can be harsh!